Before contacting us, please read through our frequently asked questions to see if the answer to your question is provided. Q: I purchased my download over an hour ago and still have not received it…where is it? A: Though rare, it is possible that your download was filtered into your SPAM folder. Please check there before contacting us. The other possibility is that you entered your email address incorrectly –which means that it may have been sent elsewhere. Contact us and we will resend it at our earliest convenience. Q: Can you send my downloads to me through the US Mail? A: I&apos;m sorry, but the only product we sent via the USPS is our book “The Parent Coach Plan.” We do not send any other products through the mail. 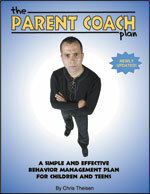 Q: Is there a discount for buying multiple books of The Parent Coach Plan? A: Yes, there is. You can view our bulk prices here. Q: Do you have a Spanish version of your product(s) available? A: At this time, our products are only available in English. Q: My adult son/daughter keeps doing the following: (insert negative behavior here)...what should I do? A: Unfortunately, we do not provide parenting advice and/or therapeutic services on this site. As much as we'd like to help we must instead suggest that you contact a mental health professional if you feel it is necessary. Q: Can you send me a sample of one of your contracts so that I can decide whether or not to make a purchase? A: I’m sorry, but we are only able to send our contracts out as part of the full purchasable package. We do not have individual contracts to send out. Q: For what ages is The Parent Coach Plan designed? A: The Parent Coach Plan will work best with children and/or teens between the ages of 5-18. Q: Do you have an editable version of your behavior contracts? A: Yes, we do. Feel free to contact us with that particular request and we will email you a Word version at no extra cost. Please allow up to 72 hours for this request.